Some of you might be wondering what to expect on Saturday, as this is likely the first parkade party you’ve encountered. So we thought we’d give you a run down on everything you need to know! Admission is free! But we will be collecting donations for Downtown Proud, a program run by Boyle Street Community Services that helps keep the core clean. We are suggesting that you donate $5 if you are able. There is something for everyone at the parkade party! 7:30 – 8:00pm – E-Town Salsa will be offering Latin dance lessons. Get ready to learn the salsa, merengue and bachata! To rev everyone up, they will end with some zumba! 8:00 – 8:30pm – nothing says carnival like a cookie eating contest! Cookie Love will be hosting a cookie eating contest featuring a number of Edmonton’s social media superstars, including Brittney Le Blanc and Liv Vors. Who will reign supreme? Join us to find out! 8:30 – 9:00pm – Sugar Swing Dance Club will be teaching Grease-inspired dance moves. Ever wanted to “Go Grease Lighting” like the T-Birds, or “Hand Jive” with the best of them? Now’s your chance! 9:00 – 11:00pm – an outdoor screening of the iconic 50s musical, Grease! 11:00pm – it’s Saturday night after all, so join us for an after party at Cask & Barrel! Throughout the evening there will also be fun carnival games! Fat Franks and Cookie Love will be serving up your carnival favorites! Media Architecture Design Edmonton (MADE) will be deploying some grass tiles as a way of transforming the parkade landscape, but for your comfort, we’d recommend bringing a chair for the movie screening! Also, we’re in Edmonton after all, so be prepared for all weather conditions (hats, jackets, blankets) – you just never know! 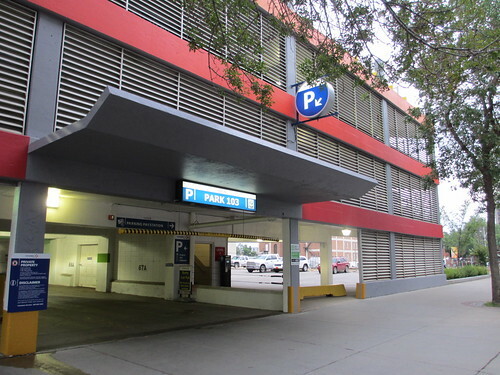 The parkade is equipped with an elevator at the 103 Street entrance. Parking is available in Vinci 103 on the lower levels (P3 and below). The rate is $3/day on Saturdays. We’re looking for some volunteers for this Saturday’s Parkade Party! The event is a fundraiser for Downtown Proud, a program run by Boyle Street Community Services, so we’ll need some helpful hands to pull it off! Roles include set-up and tear down, welcoming participants, manning a variety of carnival games, and handing out popcorn – good, old fashioned fun! If you’re interested and available, please leave a comment in this thread. Curious how this Awesome Party is going to change a traditionally one-dimensional parkade? We have some fantastic local designers working with us to utilize a unique vantage point and re-imagine this urban gem. 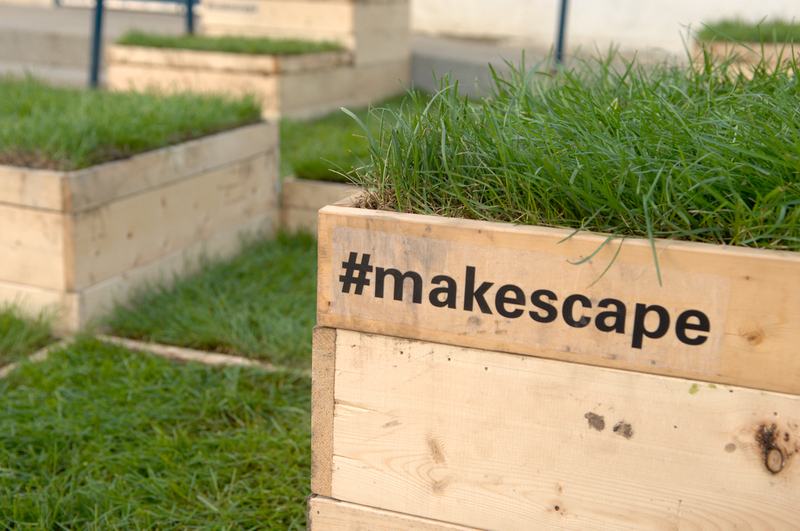 We are excited to partner with Media Architecture Design Edmonton (MADE) to integrate a re-deployable #makescape system of grass tiles onto a parkade rooftop. The grass tiles provide a unique picnic park(ade!) presence amongst the concrete asphalt jungle. #makescape is an urban intervention concept originated in Centennial Plaza as a part of a Designing Downtown project. Look out for these mobile features as they continue to be deployed throughout other events and featured in #makescape two on October 5, 2013. Relax, take a seat, and enjoy the screen from the green! In addition, the exploratory competition to locally re-design barricades was successfully completed earlier this week. With 8 prototype finalists were displayed at the 124th Street Market and Fringe Festival, Chris vander Hoek was the winner of the judge’s competition for his Barrique design while Chris Brodt and Mark Lafond won the people’s choice for Zumorph. We are thrilled to feature a some of these amazing pieces in true Parkade Party form by re-imagining our urban awesome! Now that the stage is set – just wait until you hear the spicy entertainment we’re announcing next! Stay tuned.